The year had an exciting finish! Harevavo church meets for baptisms! 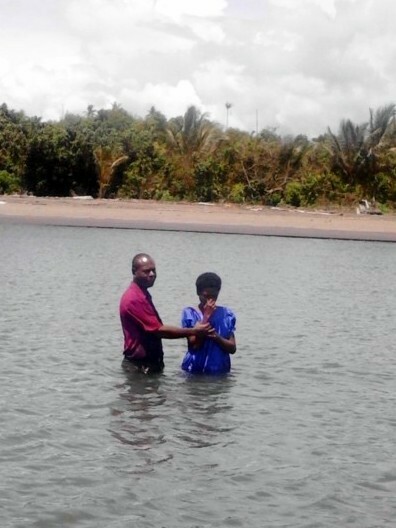 In December Pastor Murphy baptized 6 converts in Harevavo. A portable sawmill will be in Harevavo the beginning of next year, and Murphy has made arrangements with the operator to get some timber cut for the future church building. 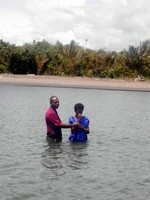 Pastor Ricky performed the FIRST baptism in Ihu Station of 6 converts!! This is the start of Ihu Baptist Church! It has not been an easy year for Ricky and Linda. We have been blessed by their faithfulness. Please keep Liberty Baptist Church in prayer for a Christmas Day evangelistic outreach. 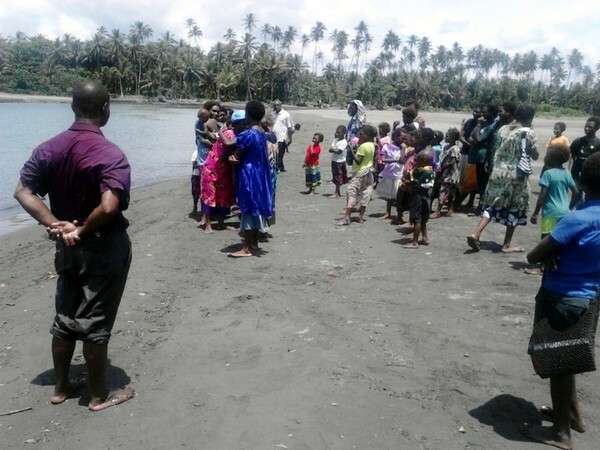 The Huruta church has never used the day to reach the lost, but this year Pastor Maisa is planning a program, preaching, and meal for the community! Baimuru Baptist gave towards the start of Pastor Danny’s needed house. Posts are in the ground, and bearers in place. Pray for strength and safety for Danny in construction, and that God will make available the needed timbers as we no longer have a sawmill in our village. Richard will be staying until we return from Port Moresby, and then he will be heading into Port Moresby to pursue a wife. He has a real growing desire to pastor, and believes God must provide a wife for him, so we will encourage him in that. He is not leaving in any way that is negative (although he will be sorely missed). I know we have been training him for something other than “us”, but I feel like being one of those selfish colleges who ask the best students to stay on staff forever. If God provides a wife, I encouraged Richard not to hurry into an independent ministry, but come out here for a short time to “figure out” being married, and to give his wife an opportunity for some training. Also, if he gets engaged, but needs to wait, he is welcome here too. He has grown in his teaching. In fact, exam week I had the classroom lights on in the evenings, and when I went over to check who was there studying, Richard was standing at the lectern asking review questions! Two student families have gone to their villages for summer vacation. Please pray for John/Dorothy and Benson/Betty as they have a desire to be a witness to their families. Pray each couple with uphold a good testimony while away from the institute. Their manner of living has a big influence upon the desire of pastors to send us students in the future. Ilaia and Vanessa will be staying on the grounds to assist with the upkeep and security of the property. Please pray for God’s protection over the campus. The Christmas season is a big time of partying, and many are emboldened by alcohol to behave foolishly. God held up Enock and Elisa from returning hurriedly to their village after their expulsion. I am sure God was giving them an opportunity to repent, sadly one that was not taken. We have a good relationship with their pastor in Bebaio, Pastor Fred. He was grieved by their actions, and he felt the couple had brought shame to their church. Please pray he will be able to minister to them, and bring them to repentance and usefulness in ministry. We send you a very BIG “thank you” for your faithfulness in praying and giving, and wish you all a wonderful Christmastime, one that is all about the Christ! Please click to download a printable copy of this letter.